Introducing Robotics with Lego® Mindstorms shows the reader how to build a variety of increasingly sophisticated computer controlled robots using the brilliant Lego Mindstorms Robotic Invention system (RIS). Initially covers the fundamental building techniques and mechanics needed to construct strong and efficient robots using the 'click-together' components supplied in the basic RIS kit. Explains to the reader, with little or no programming experience, how robot control programs may be simply constructed on their PC screens, using what may be regarded as 'software' building bricks that are supplied with the RIS kit. These programs can then be 'zapped' over an infra red link to the robot's 'brain'. This brain, called the RCX brick, contains a programmable microcontroller that is also capable of acting on information from the robots various sensors. The more adventurous reader is also shown how to write robot control programs using a conventional Windows programming language such as VisualBASIC in conjunction with the ActiveX control (called Spirit.OCX) that is also supplied with the RIS kit. 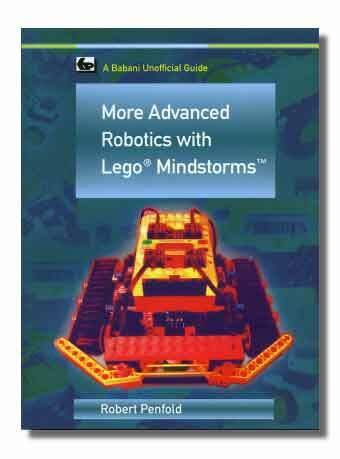 It is hoped that this book, together with the Lego Mindstorms RIS kit will give the reader many hours of entertainment and pleasure, as well as helping in the understanding of basic mechanical engineering skills, robotic principles and the practical applications of a PC loaded with suitable software. 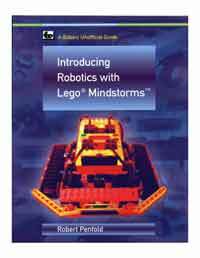 More Advanced Robotics with Lego® Mindstorms™ shows the reader how to extend the capabilities of the brilliant Lego Mindstorms Robotic Invention system (RIS) by using Lego's own accessories and some simple home constructed units. You will be able to build robots that can provide you with 'waiter service' when you clap your hands, perform tricks, 'see' and avoid objects by using 'bats radar', or accurately follow a line marked on the floor. The innovative Lego Vision Command system is also covered, and this can enable your robots to literally 'see' the world around them and respond accordingly. Learn to use additional types of sensors including rotation, light, temperature, sound and ultrasonic and also explore the possibilities provided by using an additional (third) motor. For the less experienced, RCX code programs accompany most of the featured robots. However, the more adventurous reader is also shown how to write programs using Microsoft's VisualBASIC running with the ActiveX control (Spirit.OCX) that is provided with the RIS kit. This more sophisticated approach can also permit data read from the robots to be displayed on the PC as an analogue or digital readout. It is even possible to take numerous readings over a period of time and display the results as an on-screen chart or graph. Detailed building instructions are provided for the featured robots, including numerous step-by-step photographs. The designs include rover vehicles, a virtual pet, a robot arm, an 'intelligent' sweet dispenser and a colour conscious robot that will try to grab objects of a specific colour. Control software for all the robots is provided, together with detailed explanations of how these programs operate.